Some new risks include emerging U.S. laws and regulations, the leaning and globalization of supply chains, data security and cybercrime, the rise of social media and importance of online reputation, and even an increase in the frequency and severity of extreme weather incidents. Some of these may seem inconsequential at first. For example, social media may seem like a harmless way to maintain contact with customers and prospects; yet, a negative review from an angry customer or questionable business practices shared by a disgruntled former employee can, in the right (or wrong) hands, have a seriously damaging effect on a manufacturer’s reputation with customers or potential employee pool. Similarly, shifting employee laws and regulations may be considered simply something that need to be reviewed from time to time. However, depending on the nature of changes, a manufacturer could find itself needing to address significant labor issues or even restructure parts of the business to minimize the impact of labor shortages, costing large sums that could be put to better use. Risks to a company’s supply chain come in many forms. Global sources mean more complex supply lines and potentially suppliers in less stable parts of the world. Tariffs or other restrictions can mean increased prices for or a slowdown in the delivery of certain materials. Extreme weather incidents and events such as port strikes can limit or even halt the ability of suppliers to deliver as promised. Know your biggest supply chain risks. What materials, components, and/or equipment can you absolutely not do without? What will you do if you can’t get them and, in that event, how long could your business last? Evaluate your critical suppliers. Where will you turn if you have just one supplier for a particular material, and that supplier can’t deliver? Understand suppliers’ strengths and weaknesses, and explore backup suppliers to have at the ready in case one becomes unavailable. Refine your LEAN approach. Operating with a LEAN strategy offers many advantages. However, less inventory on hand can elevate risk. The LEAN approach allows you to tolerate only brief interruption periods, while longer inventory durations offer a protective buffer. Operational risk refers to any kind of disruption to your normal facilities and operations. Failure to properly prepare could lead to a loss of customers and revenue. While you can’t anticipate every possible contingency, you can focus on getting the level of risk down to a tolerable level. For example, most manufacturers couldn’t have predicted the level of flooding that took place in Houston with Hurricane Harvey. But they could prepare for flooding in general, especially in flood-prone areas. Plan and practice operational mitigation. 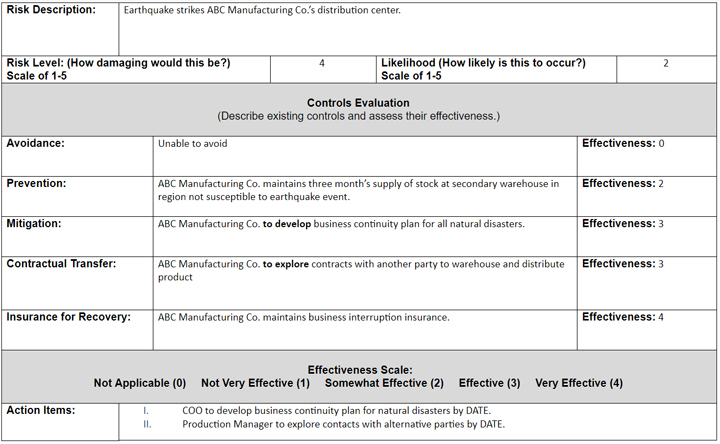 Develop a plan for conditions that would cause an operational disruption. Conduct drills for things like natural disasters, equipment malfunctions, and other likely disruptive events. Consider high-impact but simple protections. The steps involved in maintaining operations don’t have to be complicated or expensive. For example, having spare equipment on hand could save a lot of headaches and expense in the event a critical piece of machinery breaks down. There’s no question about it: data security is a challenging problem that is growing more complex every day. As many safeguards as you put in place, there are just as many ways for hackers to access it or limit your ability to do so. Disgruntled or recently let-go employees pose frightening additional threats. Such incidents can cost your company considerable time, money, and reputational damage. Back up your data. Backups are critical because they can save you if you’re hacked or ransomed, or if your equipment is damaged or breaks. If you don’t have backups in place, establish backups. If you do have backups in place, focus on testing backup solutions that are in place. Restrict data rights. Not everyone in your company needs access to all data. For example, sales people need access to your customer database, product information, and so on, but not product designs. As employees or suppliers end their relationships with your company, have a process to promptly shut down their access. Manage your cybersecurity risk. If you aren’t sure where you are or you are starting from ground zero, an assessment is the best way to start. Be sure to address both technical (software and hardware) and human vulnerabilities in a cybersecurity program. Talent is another area that is subject to significant threats from many directions, and certainly this area is of utmost interest to the manufacturing industry. Schools not covering applicable skills, shifting employment and immigration laws, and your company’s ability to provide an attractive compensation package and work environment are all areas that could potentially cause a steady flow of quality workers to falter. Anticipate risks. Try to choose employees from a stable talent pool. When necessary, change your strategy. For example, you could evaluate strategies to keep experienced workers if newer and younger workers will take longer to get up to speed. Plan for the future. Even if you have a great workforce now, consider what will happen when people leave for other positions or the environment changes. What if you lose a key employee? Who will replace them? Start cross-training people early so someone will be available to fill those positions in the future. Be proactive. Form relationships with public/trade schools, industry groups, and universities. Define what you need and what you can offer in terms of incentives, opportunities, etc. Consider an internship or mentor program to develop your own people. Take the necessary steps to make your company a great place to work. Some regulations are easy to keep up with, but others require considerable outlays of time, money, and specialized expertise to stay in compliance. Most manufacturers understand that investing in long-term relationships with a team of advisors (accounting, finance, legal, technology, etc.) can help provide them more advanced notice to these kinds of risks — but sometimes it takes some prompting. And, even if you’re in compliance most of the time, a single incident (such as lack of a timely recall on a bad product by a food manufacturer) can get you into deep trouble. Consult with experts. Whether your consultants are internal or external, hire the best. And don’t forget to “ask the question.” Schedule a discussion about what your experts feel are the biggest new/developing risks for your organization. Build and stick to effective processes. Work with your experts to build the necessary processes to comply with all relevant regulations. Once you and your employees have the steps down, be a stickler about adhering to them and give someone authority to check that they are being followed. Model appropriate behavior. Compliance is everyone’s job, but a lax attitude from management can quickly spread throughout the company. Everyone from the CEO on down should take full responsibility for compliance. Manufacturers have to be even more careful now than in the past to do right by customers and maintain strong ethics. This is especially true for consumer product companies that offer products with a halo (e.g. organic, fair-trade, environmentally sustainable, etc.) The “right thing” may differ between industries, companies, or who your customers are. But one slip (think Volkswagen) can spread quickly across social and traditional media and impact your reputation, leading to a loss of business and revenue. Monitor reputational performance. Even if you don’t have a dedicated website or social media professional, make sure someone in your company is regularly checking popular platforms to see what people are saying about your company. There are alert tools available that can make it easy to do this. Have policies for people. An employee that’s been let go can be one of the worst dangers to your reputation. Have a strategy in place for reacting to possible scenarios. Do the right thing. If you notice something questionable or wrong in your process, don’t wait to issue a recall. Post information about the situation on your website and social media outlets, and immediately issue a press release. Can I avoid this situation? If not, can I increase prevention and reduce the likelihood of it occurring? Can I mitigate the risk to lessen its impact on my business in the event that the risk does materialize? Are there ways to transfer the risk contractually to another party? For remaining risk, am I willing to bear the risk or should I purchase insurance to financially protect the organization? Asking and answering these questions will go a long way toward maintaining success in the face of risk. EKS&H helps manufacturers with a range of issues, from accounting to tax and audit to technology and talent. We have over 200 manufacturing clients and partner with many industry organizations, including the National Association of Manufacturers (NAM). To learn more about how EKS&H can help your manufacturing company navigate industry-specific risks, please contact John Murphy, Consulting Manager, at 303-740-9400 or jmurphy@eksh.com.